Campsite Château de Grange Fort is a campsite with 119 touring pitches. During low season, between 01-04-2019 - 06-07-2019 and 25-08-2019 - 15-11-2019, the nightly rate is €18,- at one of the 119 touring pitches at Campsite Château de Grange Fort in Les Pradeaux (Puy-de-Dôme). At this campsite you can not only use your CampingCard ACSI for inexpensive camping, you can also use your ACSI Club ID (as an alternative ID). 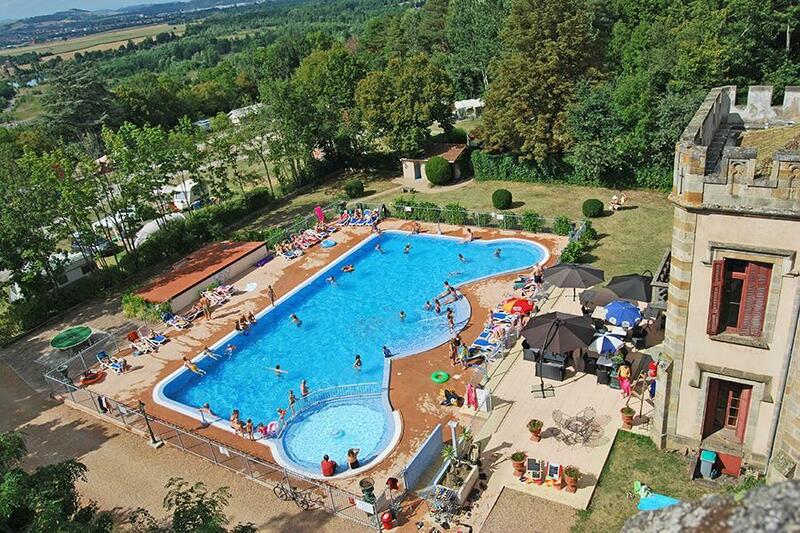 This castle campsite located in the heart of the Auvergne offers peace, ambiance and numerous leisure activities. You can enjoy the heated indoor swimming pool and a delicious meal in the castle in early and late seasons. This place is a gem, just loved it. We chose our own pitch which had good hedges making it seem very private. The site was very tidy and a joy to walk around the different tracks discovering things such as the orangery and the walk down to the river. The sanitary block was clean although I did find the indoor pool rather fresh. The restaurant provides a basic menu and was good quality at a fair price. Fresh bread was ordered, it was excellent quality. The family who owns and has run the site for 32 years are friendly and when I raised a reported a blocked sink caused by another camper it was dealt with immediately. A site in a lovely location which I am sure we will return to. Nice site situated in the grounds of an old fort. Owned and run by a Dutch couple. Bread ordered for next day. Showers and toilets although clean could be updated showers only warm. Most pitches are tight to get into so a mover is required . wonderful views over the surrounding area. Have been stoping here for years to and fro south of France and Spain. Stayed here for one night. Chateau gardens are beautiful. Staff at reception (?owners) were extremely friendly and helpful. Staff at brasserie were efficient and very friendly and we spent a very pleasant evening chatting to a French couple and a Belgian couple. Food was good and reasonably priced. However we thought the pitches needed some attention as the hedges were very overgrown and the pitches were mostly soil with sparse grass - surprising given we stayed early in the season. I am sorry to say we found the unisex sanitary facilities to be inadequate. We stayed just one night in September on our way south. The site was easy to find and although reception was closed we were invited to site ourselves and on checking in later were given a warm welcome. We chose a large open pitch with lovely views, some of the pitches on the other side were quite enclosed and seemed dark. It was a fair distance to the toilet block and these did look as if a little refurbishment was needed although the water was hot. We enjoyed a reasonably priced tasty meal from a small menu in the brasserie. A very friendly and helpful owner. Toilets facilities clean and tidy.. heated pool great. Lovely quiet site. Absolutely recommended for a stay here be it overnight or longer. If I am travelling down this way I would happily stay again. Enjoyed four days here in late June, owners were perfect hosts. Pitch was large with beautiful view. Pleasant indoor swimming pool and fantastic outdoor pool which was being filled ready for the high season. Thoroughly enjoyed our stay and will definitely return. 2 overnachtingen op de heenweg en 1 op de terugweg naar/van zuidkust. Bijzonder omgeving, kasteel, bos, en prachtig uitzichten vanaf je plekje, zeker op een zachte nazomersavond met glaasje wijn in je hand. Toegang tot kampeerplekken kán moelijk zijn, maar het is kiezen voor het uitzicht of het gemak. Fijn dat je een drankje en hapje kunt eten in de brasserie. Sanitair is wat verouderd, maar wel schoon en prettig gesitueerd in het centrale binnenhofje van een oude boerderij. Prachtig buitenzwembad voor het kasteel gebruikt op de heenreis, water was fris maar goed te doen, zonnetje was heerlijk, had het urenlang helemaal voor onszelf. Op terugweg was het gesloten, maar heb wel even getoefd in het verwarmde binnenbad in de serre. Zeer de moeite waard om het een keer te bezoeken! A nice spot to stop for a couple of days to or from the south nice veiws. Some of the pitches are very difficult to get onto as the access roads are quite narrow. Our caravan mover broke and we had to get help from the owner as are large twinn made it very tight. toilet facilities not that good most closed and the water was only warm. however the bar / restaurant was good food and value. We did stop on the way back also and stayed on the pitches in front of the castle which was better. Would you like to book Campsite Château de Grange Fort or request more information? You can do both using the information below or by visiting the campsite's website. On A75 exit 13 dir. Parentignat. 1st turn to right at roundabout after 1.5 km, dir. St. Rémy-de-Chargnat via D999. Then right again at 2nd roundabout after 1.5 km, dir. Les Pradeaux (D34). Campsite 1 km on the right. CampingCard ACSI will send your information request to "Campsite Château de Grange Fort".